Serverside developers have it easy! Well, no ;). But there are paradigms that have become the norm now. If something bad happens and you get a 404 or a 500 error on a webpage, its pretty likely that its been logged and if its on a major product, alarms have been raised. Client side code, especially in the languages I have worked in the last couple of years, have been less…communicative. I would like to focus on AIR and Flash here since those are the technologies I work with most often. The problem becomes more critical in AIR where you have much more things that can go wrong since you are interacting with items on the user’s machine which is not a controlled environment. 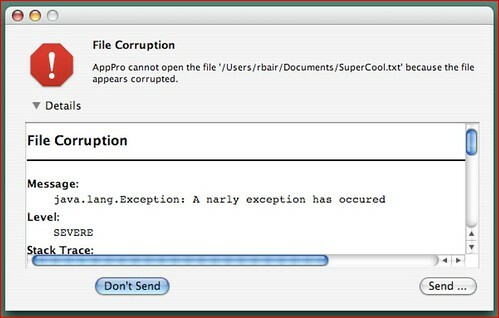 Very few client side web apps I have worked with, including my own, have ever seemed to have handled error correctly. Most of the time, the app has been scoped with time allocated against the features and error states have never been considered. Occasionally, a developer will put in an Alert window or something similar just as a precaution (I know I have). In Flash/AIR there doesnt seem to be a good library that I can integrate into my application that encapsulates best practicess. Heck, I dont even know what the best practices are, which is what prompted me to write this post. What would you include in the error window? An error description: What happened ? Corrupt file? Cannot connect to server? Something readable. For bonus points, can the user do anything about this, like restart the application? The last point is kind of interesting, cause you might want to send more than just the stack trace of the error. You might want to set the whole application state. If you have application logging enabled, say with something like the CIM logging framework, the whole log file might be of interest. Again, the developer must ensure that he is only logging non-personal information there. Of course there are situations when the error might cause the entire app to blow up, without giving it enough time to react to the error. Would it make sense to log and end of session event and allow users to send the application log to the server if the end of session was not successfully logged for a prior session? A step up would be the UI from crash reporters which would perhaps be overkill for a web app, but would make a lot of sense for desktop apps, especially in the beta stages. Here is a screenshot from something called Bug Buddy. Whats kind of interesting here is that it adds a field that allows user to add information about the context of the crash, as well as an email address that may be used to contact him or something. 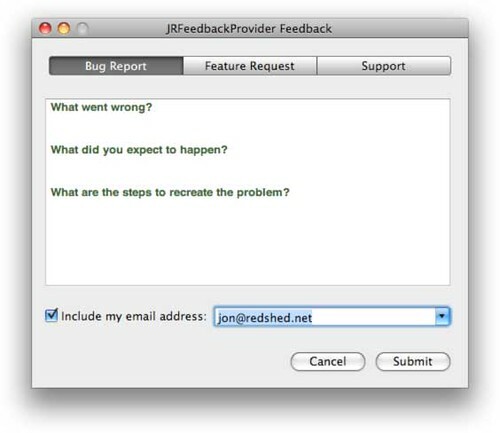 The last screenshot is from an open source library called JRFeedbackProvider someone presented at the Philadelphia Cocoa Users Group.
. This has the features of the previous crash reporters but also adds a “request a feature” tab which is great if you are running an alpha version of your application and are looking for more than bug reports. If you have seen any other error UI that seem to do a good job, please add a comment here.